CHAMPAIGN, Ill. — The hot seat Illinois coach Lovie Smith has found himself on lately cooled down a bit on Saturday as Illinois beat Minnesota 55-31 in a game that saw some impressive and long scoring runs. Meanwhile, things are heating up for Minnesota coach P.J. Fleck, who has watched his team drop five of its last six games. Illinois managed to win in dramatic fashion. Reggie Corbin rushed for 213 yards and two touchdowns — both coming on runs of more than 70 yards — to become the first Illini player to rush for two 70-yard-plus touchdowns in a single game since 1944. It was Corbin’s fourth 100-yard rushing game in the last five games. Minnesota (4-5, 1-5 Big Ten) had trouble all game stopping the run, giving up 430 yards and five touchdowns on the ground. Illinois racked up 646 total yards of offense. The 55 points were the most for Illinois (4-5, 2-4) since Smith took over as head coach before the 2016 season. Illinois quarterback AJ Bush managed the game well and accounted for four Illinois touchdowns, going 18 of 25 for 216 yards passing with two touchdowns and one interception. Bush rushed for 127 yards on 14 carries and two more touchdowns. Redshirt freshman Tanner Morgan got the start again at quarterback for Minnesota after an excellent performance in beating Indiana last week in his first career start. True freshman Zack Annexstad won the job in fall camp, hurt his ankle in the third game, played through it rather ineffectively and then suffered an unspecified midsection injury in a loss at Nebraska on Oct. 20. Morgan had the first 300-yard passing game last week for the Gophers since 2015 and may have secured the starting role even if Annexstad gets healthy. Morgan was 14 of 27 for 258 yards and two touchdowns against Illinois. 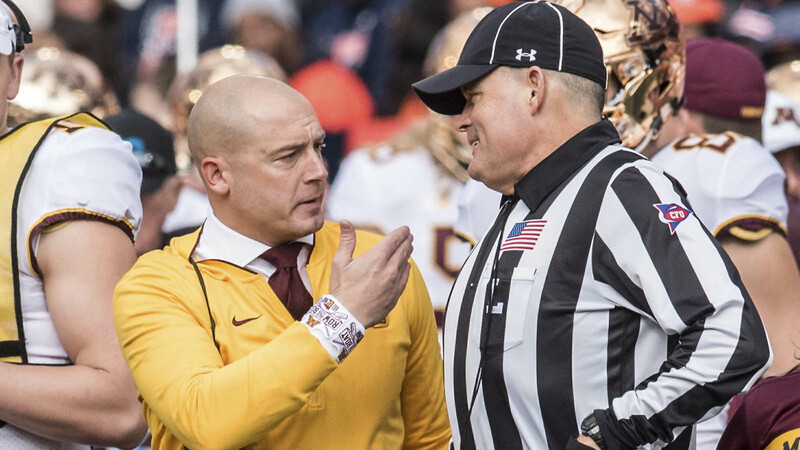 Trailing 31-17 midway through the third quarter, the Gophers were starting to click offensively and were driving when running back Seth Green fumbled on the Illinois 30-yard line. On the next play, Bush lofted a pass to Daniel Barker for an easy score and a 38-17 lead. Minnesota: Needs six wins to nail down a bowl bid, and Saturday’s defeat makes it all the more difficult. With three games left, against Nebraska, Iowa and Wisconsin, they need wins in two of them. Not impossible, but not easy. Illinois: Calling the defense after the abrupt resignation last week of coordinator Hardy Nickerson, Smith acquitted himself well, with his defense giving up 438 yards, substantially less than in past weeks.